What do a TIM barrel and flavodoxin have in common? 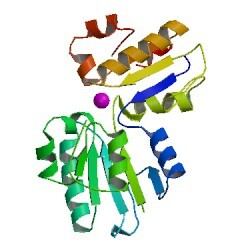 Flavodoxin which folds with 2 α-helixes on the outside sandwiching 5 β–strands in the core. So the common theme: they both have α–helixes on the outside, sheets on the inside. The underlaying question here is: How is one fold converted to the other? Figure 1: At first glance, proteins that fold into a barrel-like shape (left) and proteins that fold into a sandwich-like shape (right) appear completely different. However, analyses of their amino acid sequences as well as a recently identified intermediate form (centre) have revealed similarities that suggest a common evolutionary origin. In order to address this question they used Hidden Markov Models to investigate similarity between protein super families. They search through the SCOP database to find proteins that are as similar to flavodoxins as TIM barrels. However first they notice that some flavodoxin folds have more in common with TIM barrels than other flavodoxins. But more importantly they come across a hypothetical protein TM0182 from Thermotoga maritima. They crystallised this protein and it shows six β-strands in the core sandwiched by 2 α-helixes on one side and 3 α-helixes on the other side. The core similarity is a stretch of two α-helixes and two β- strands (Figure 1). Based on this finding one can speculate about the evolution and relation ship between the TIM barrel and the flavodoxin fold. The authors note that it nicely fits in with Thomas Cech his theory that RNA units were the predecessors of proteins, where the so-called ribozymes performed the catalytic function in the early days of life. This theory also describes how ‘early peptides’ folded onto nucleic acids as scaffold. But more prominently it brings forward the principle of modularity in proteins, it shows that proteins are evolved from smaller proteins by duplications and modifications.